Naturally occurring 197Au and 58Ni foils were subjected to the neutron irradiation by placing them in a dry tube-I of Kalpakkam Mini reactor to produce gamma emitting 198Au and 58Co nuclear reaction products. The efficiency study of high-purity germanium detector corresponding to characteristic gamma energies 0.4118 and 0.8107 MeV of 198Au and 58Co was carried out by the methods of calibration of 152Eu and covariance. The calibration source 152Eu consists of many characteristic gamma lines. It can be used for the efficiency calibration of high-purity germanium (HPGe) detector as its activity is known. It is not possible to measure directly the efficiency of HPGe detector for known energies of characteristic gamma lines of nuclear reaction products as their activities are unknown. However, it can be known using the methods of calibration of 152Eu and covariance. This finds an application in knowing the nuclear reaction cross section of 198Au and 58Co. Geraldo and Smith carried out work on least square methods and covariance matrix applied to the relative efficiency calibration of a Ge (Li) detector. Geraldo and Smith, carried out work on covariance analysis and fitting of germanium gamma-ray detector efficiency calibration data. Vidmar carried out work on EFFTRAN-A monte carlo efficiency transfer code for gamma-ray spectrometry. Jose et al., carried out work on the estimation of radioactive nobal gas activity in Fast Breeder Test Reactor (FBTR)-A simple method of calibration of HPGe detector. Shivashankaret al. carried out work on measurement and covariance analysis or reaction cross section for 58Ni(n, p) 58 Co relative to cross section for the formation of 97Zr fission product in neutron-induced fission of 232Th and 238U at effective neutron energies En = 5.89, 10.11 and 15.87 MeV. Sheelaet al., carried out work on the efficiency of HPGe detector at characteristic gamma energies of 58Co and115m In in the reactions 59Co(n, 2n) 58Co and 115In(n, nI)115m In respectively. Further, they carried out the covariance analysis. In the present study, the efficiency study of HPGe detector corresponding to characteristic gamma energies 0.4118 and 0.8107 MeV of 198Au and 58Co was carried out by the methods of calibration of 152Eu and covariance. Naturally occurring foils 197Au and 58Ni with 99.85% purity procured from Alfa Aesar, USA, have been irradiated with neutrons consisting of spectrum of energies each with 3 h time by placing in dry Tube-I location of Kalpakkam Mini reactor to obtain nuclear reactions 197Au(n,γ) 198Au and 58Ni(n, p) 58Co. 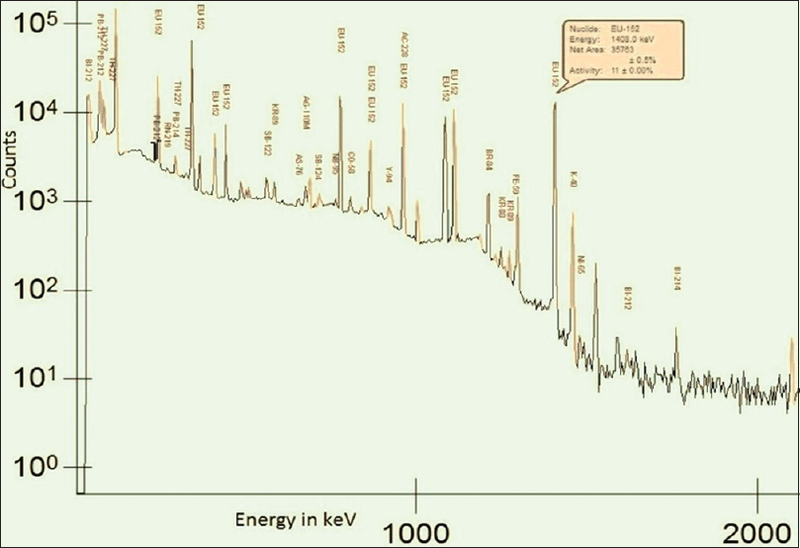 The obtained products 198Au and 58Co are capable to emit gamma with characteristic energies 0.4118 and 0.8107 MeV respectively. Their gamma spectra have been measured using p-type co-axial vertical HPGe detector of Dounreay Stakeholder Group make available at FBTR laboratory, IGCAR. The resolution of the detector is 1.8 keV at 1332.5 keV. The measured spectra are shown in [Figure 1] and [Figure 2]. The measured spectrum of calibration source 152Eu is shown in [Figure 3]. The point source 152Eu capsulated in a thin disc of araldite. The analysis of the spectral data has been done both with softwares of APTEC Engineering Ltd., Canada and GENIE-2000 Canberra Industries Inc., Meriden, USA. The full energy peak efficiency of HPGe detector was measured by considering nine gamma-ray energies (Ei, 1≤i ≤9) of 152Eu source. The source in our experiment was placed 8 cm from the detector. Hence, the correction factor kc due to coincidence summing effect was estimated using Monte Carlo simulation code EFFTRAN., The source was procured on March 1, 1999 with initial activity A0 was 45500 Bq. The efficiency ε(Eγ) of detector is given by. 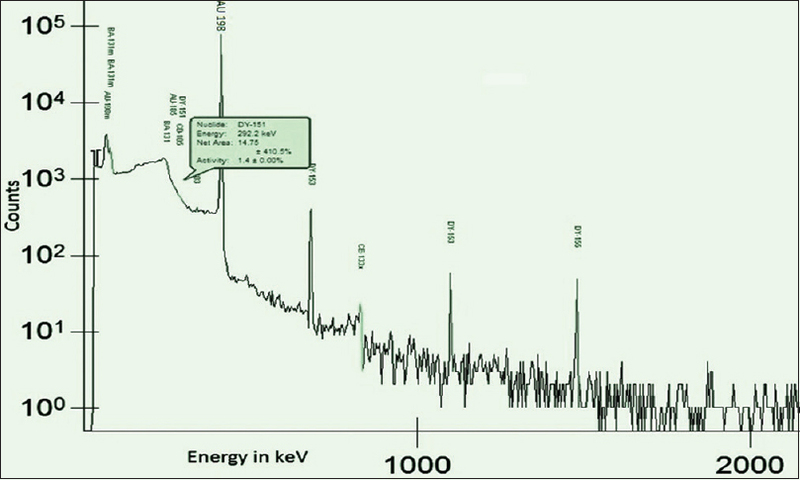 Where Eγ is γ energy, C is counts obtained from the measured 152Eu gamma spectrum, Iγ is γ abundance, T½ is half-life (13.517 ± 0.014y), t is time elapsed between source and detector calibrations (17.92y). The decay data Iγ at each of the mentioned energies and T½ are retrieved from ENSDF data sets maintained by National Nuclear Data Center. The input data and the obtained detector efficiency ε(Eγ) at each of the gamma ray energy of 152Eu are listed in [Table 1]. The comparison of the detector efficiencies with and without correction factor due to coincidence summing effect is shown in [Figure 4]. The uncertainty (Δεi in efficiency εi ranging from ε1(Eγ1) to ε9 (Eγ9) is obtained using the following relation. where ΔCi, ΔIγi ΔA0i and Δλi are partial uncertainties (ekr) in Ci, Ii, AOi and λi respectively. ekr is obtained with the following relation. Where k = 1, 2,….9 corresponds to γ energies of 152Eu and r is attribute with 1≤r≤4. The obtained values of Δεi and ekr are shown in [Table 2]. The microcorrelation matrix Sij is shown in [Table 3]. The covariance matrix Vεij is obtained with the following relation and the obtained values are shown in [Table 4]. Where δεkor Δεi and δxr are partial uncertainties in efficiency εk and partial uncertainty in xr(C, Iγ, Ao and T1/2), respectively. 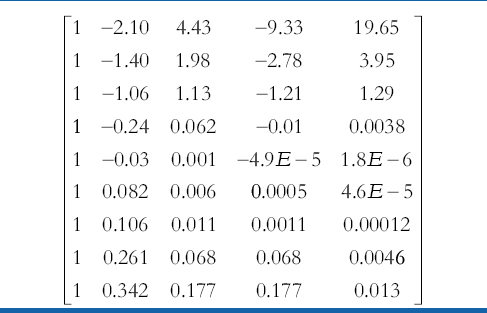 The macro-correlation matrix Cεij due to Δεi and Δεj is obtained with the following relation and its values are shown in [Table 5]. 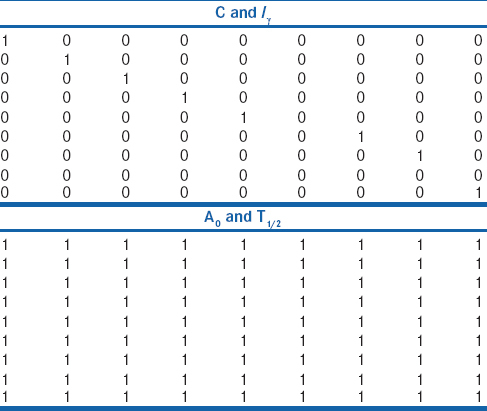 The covariance matrix Vzij is obtained with the following relation and its values are shown in [Table 6]. Matrices Z, A and P can be obtained with the following relations. Where 1 ≤ i ≤ 9, 1 ≤ k ≤ m, m = 2, 3.8. The covariance matrix Vp can be obtained with the following relation. A and Vp matrices can be generated for various m values lying between 2 and 8. In the present case, m = 5 is considered. Their values are shown in [Table 7] and [Table 8], respectively. Fitting parameter matrix P is obtained with the following relation and its values are shown in [Table 9]. The obtained x2 and values are 5.93 and 1.48 for m = 5, respectively. The obtained values for m = 2, 3, 4, 6, 7 are 63.4, 18.6, 3.8, 1.45, 0.29, and 0.568, respectively. The two values for m = 5 and 6 are closer to one. m = 5 was considered for further calculation as this was less than the other. The design Ac, linear parametric Zc, covariance VZc, efficiency covariance Vεc, and correlation Cεc matrices. 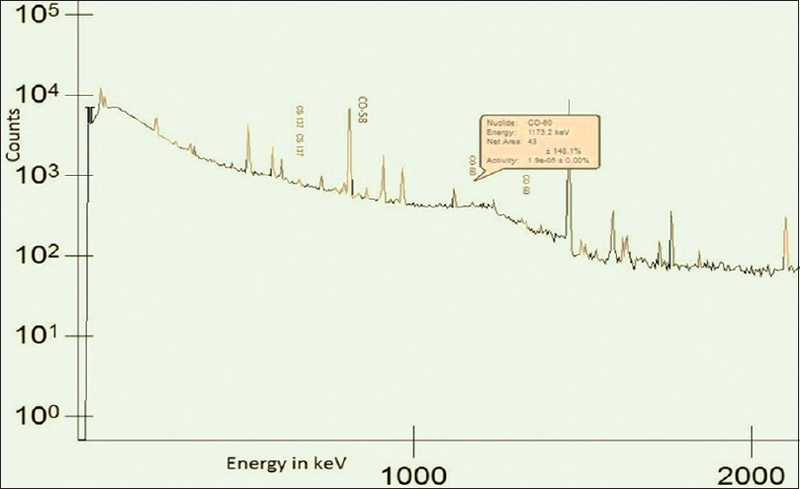 For 198Au (0.411802 MeV) and 58Co (0.810759 MeV) were obtained with the following relations. The obtained values of εc, Vεc and Cεc are shown in the [Table 10]. The energy depended efficiency calibration of HPGe detector corresponding to characteristic gamma energies of 152Eu has been carried out. The fitting parameters have been estimated by Chi-square test. 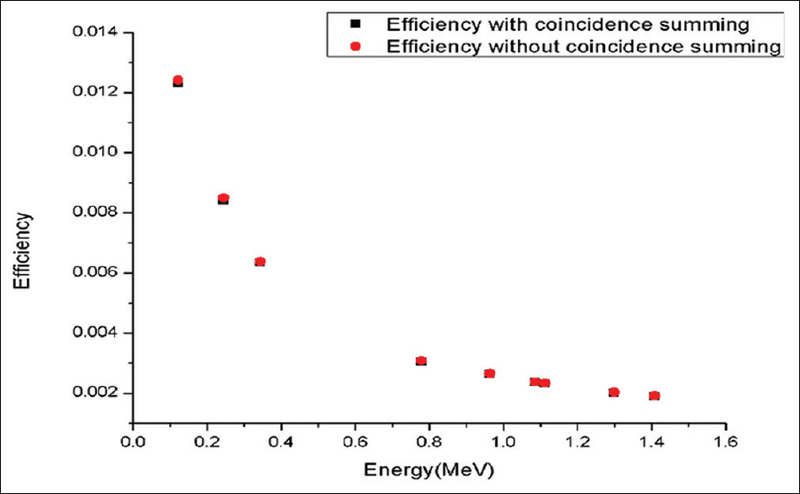 The efficiency corresponding to characteristic gamma energies 0.4118 and 0.8107 MeV of 198Au and 58Co nuclear reaction products of unknown activity has been estimated by the knowledge of fitting parameters and the corresponding covariance study has also been carried out. The research work was supported by DAE BRNS, Mumbai through a major research project (sanctioned No. 36 (6)/14/92/2014 BRNS/2727). Geraldo LP, Smith DL. Least square methods and covariance matrix applied to the relative efficiency calibration of a Ge (Li) detector. Instit Pesqui Energeticas Nucl 1989;243:1-16. Geraldo LP, Smith DL. Covariance analysis and fitting of germanium gamma-ray detector efficiency calibration data. Nucl Instrum Methods Phys Res A 1990;290:499-508. Vidmar T. EFFTRAN-A Monte Carlo efficiency transfer code for gamma-ray spectrometry. Nucl Instrum Methods Phys Res A 2005;550:603-8. Jose MT, Baskar S, Meenakshisundaram V. Estimation of radioactive nobal gas activity in FBTR- A simple method of calibration of HPGe detector. Conference IRPA12, 3; 2008. Shivashankar BS, Ganesan S, Naik H, Suryanarayana SV, Nair NS, Prasad KM. Measurement and covariance analysis or reaction cross section for 58Ni (n, p) 58 Co relative to cross section for formation of 97Zr fission product in neutron-induced fission of 232Th and 238U at effective neutron energies En=5.89, 10.11 and 15.87 MeV. Nucl Sci Eng 2014;179:423-33. Sheela YS, Naik H, Prasad KM, Ganesan S, Nair NS, Suryanarayana SV. The efficiency and error covariance matrix of HPGe detector at characteristic gamma energies of reaction products 58Co and 115mIn in the Measurement of 59Co (n, 2n) 58 Co Reaction Cross Section Relative to 15In (n, n') 115mIn. Internal Report, No.MU/Statistics/DAE-BRNS/2017/2; 12 March, 2017. NuDat 2.7, Nudat 2.7 National Nuclear Data Center, Brookhaven National Laboratory; 2016. Available from: http://www.nndc.bnl.gov/nudat2/. [Last accessed on 2018 May 04].